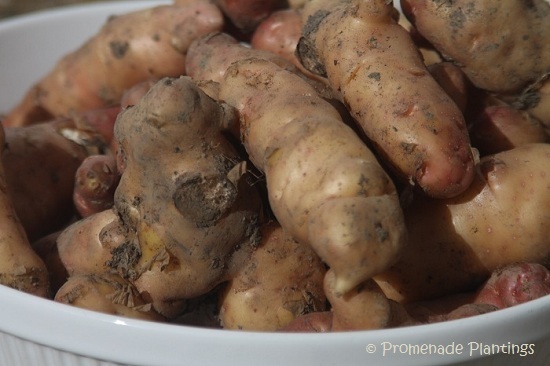 Have you ever grown and eaten your own potatoes? Do you just think that there are white ones for chips and red ones for mash, and those little new ones that are really expensive in the shops? That was probably my sum knowledge before I started to grow my own veggies. I used to wonder what the fuss was all about. I’m now a convert. Freshly dug potatoes are special. Their flavour is pitch perfect. And they are as cheap as chips. Pun thoroughly intended. And guess what they are easy to grow, they were one of my first successful crops, and frankly if I managed it then anyone can. 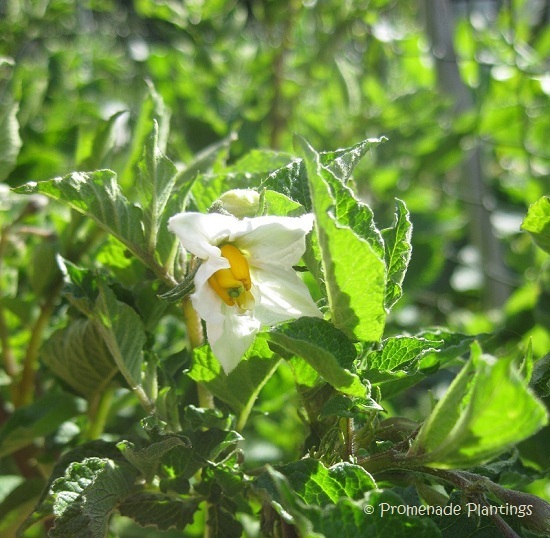 Planting a potato is like planting a promise. It’s time to sort my potato orders out, get them delivered and get chitting and then onto planting them. Chitting, is yet another gardening term that I had to learn if I was to be able to read an article about growing potatoes AND understand it. 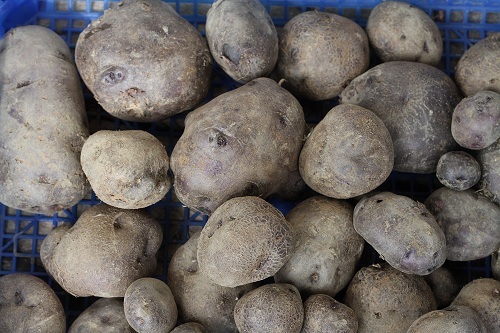 Chitting is the process of getting potatoes to start sprouting. So by the time you plant them they have had a head start. Reams have been written on the subject, some people swear by chitting others decry it as a waste of time. Basically you place your seed potatoes in good light and encourage them to sprout. I do it for my early potatoes, and if I have the time and inclination the same is true for the Seconds and Maincrops. “Earlies take about 13 to 14 weeks to develop before they can be dug, Second earlies take 16 to 17 weeks and Maincrops about 18 to 20 weeks.” Good, glad we got that sorted. A little tip? I make a diary note of the date I planted the potatoes and another entry for when they will be ready. My memory isn’t what it should be! Which spuds to grow ~ Potatoes are fickle friends. Did you know that already? 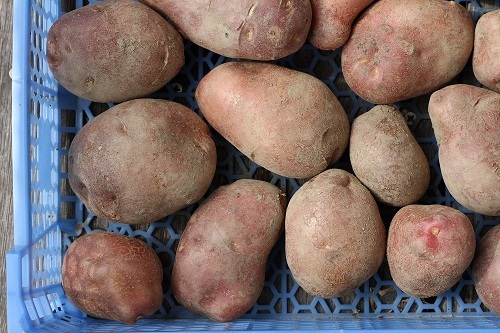 I’ve read many a review of potato varieties and how great they are only to be truly disappointed when I’ve grown them, I ‘m thinking of Lady Christl, they were positively disappointing, even dare I say it miserable and yet other growers waxed lyrical about them. You see potatoes grown in one part of the country will differ in flavour to those grown in another. That’s what I call fickle. But I secretly like them for it. However it does give an extra frisson of excitement and doubt when trying new varieties. I’m on the hunt for a tasty first early. So far they have been elusive. Last year was probably the best with Red Duke of York, I also grew Sharpes Express but wasn’t wowed by them. 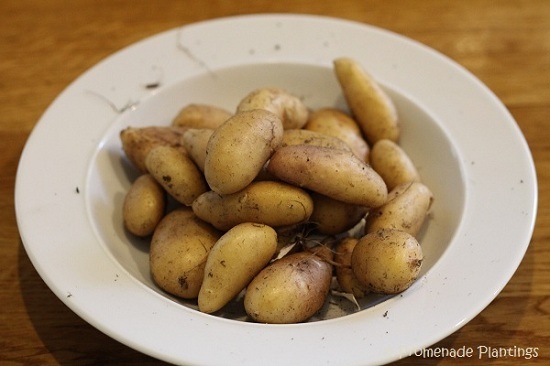 After that I need to decide on some 2nds, I see these as my salad potatoes – Ratte were gorgeous last year, lovely texture and colour, took no cooking at all and were heavenly with a dot of butter and some chopped chives or mint. No doubt I’ll find some room for Charlottes as a 2nd, and absolute classic salad potato. As to Maincrops and more salad type potatoes I had a break from Pink Fir Apples last year, and yes I missed them and grew Belle De Fontany, a close cousin. Tasty but again I missed the wow of a home grown potato. But I did grow Mayan Gold and they more than made up for others shyness in the taste department. Mayan Gold or Twighlight – the deep buttery yellow flesh has hooked me in. Between Alan Romans and JBA Seed Potatoes they will give me the amount of potatoes and the varieties I want. I only want to grow a few of each I don’t need several hundred weight in potatoes, I don’t need to sink the navy. Or feed them for that matter. It’s amazing how far a few potatoes will go when in the ground. You see they are not just fickle but clever, from that one potato you plant you will get at least a dozen more. See I told you they were as cheap as chips. If you are short on space just grow Earlies. The taste is all wow, and they don’t suffer from pest or blight damage. Unless I get some extra growing space this year I won’t bother with a maincrop, so bye bye Salad Blues and Pink Fir Apples, it was lovely growing you but space is space and frankly we just don’t eat that many potatoes. Ways to grow them ~ they are reputed as perfect ground breakers, but it will be you that will be doing most of the ground breaking, simply by earthing them up. My first year of growing them, I diligently did this. Digging and lumping clods of clay-soil up them. It worked I got beautiful spuds and the ground was broken up. The following years, I haven’t been as diligent. Yes an admission. It’s time consuming, and hard work. And besides I’ve since become “enlightened” or rather I grow lots of other stuff that takes up more of my energy. So I sort of earth them up, but I do so by using lots of mulching material, I no longer do the back breaking digging, it’s mulch, mulch, mulch all the way. Panic Ye Not! Mulching yet another gardening term – its all about keeping the moisture in, and the weeds at bay. You can even plant potatoes in a shallow hole, place black plastic over them, remember to cut a whole in the plastic so the plant can grow through it. And yes, no earthing up. But I understand you are creating some kind of slug and snail heaven. They’ll be travelling miles just to go and live in that shiny damp residence. And slugs like potatoes. You can grow spuds anyway you like, in bins, in buckets, in boxes and in bags. And yes even in the ground. I’ve seen people who will peg a stake in the ground, tie a piece of string to it and then carry it to the other end of the bed, tie the string to another stake and create a perfect and straight planting line. So that when they earth up their spuds they create the most beautiful straight lines, and have a triangular thing going on. I admire them in a sort of warped way, but frankly I just think that’s showing off (oh and having too much time on your hands and possibly being a bit OCD about it too). I think they are showing off their perfect soil. You see you can’t create a triangle shape with lumps of clay. So it’s mulch, mulch, mulch for me, and a vague bit of drawing up the soil around my potatoes with my Azada. How to plant them ~ A word of warning, don’t plant them too deep – the first plantings may need protection from the frost, but after that they will grow and grow. And when you come to dig them up, if you have planted them too deeply you will be digging for …. miles underground. Caring for them ~ well we’ve already covered earthing / mulching. Other than that there is very little care needed. The will need sunshine, warmth and water. But that’s true of all plants. Pest and diseases ~ did I see mention of slugs? Yes, they like them. And as with all plants they have their friends and foes. Blight and Scab are 2 that get many mentions. It’s worth having a read up, or at least look up some gruesome photos to know what to look for and do. Harvesting them ~ Take some kids along with you, borrow some if you have to. I haven’t met a kid yet who hasn’t been whisked up in the excitement of digging for treasure and hunting out all the potatoes, it’s like digging for gold. Cooking Potatoes ~ before you order, buy and grow potatoes have a think about how you like to eat them. Is it chips, salad potatoes, roast potatoes or mash you are after? There is a variety for every occasion. I love that phrase…planting a promise! Thank you, maybe it sums up gardening as a whole ? We plant our potatoes in a barrel, and as the stems reach above soil level, we add another layer of soil to keep all but the top leaves underground. New potatoes grow from nearly every leaf joint that’s under the soil. To harvest we have a little door at the bottom of the barrel that we open, pulling out soil and potatoes from the base of the barrel rather than from the top. We usually only grow for ‘early crop’. The Mayan Gold make for great roasties, by the way. Not so brilliant for boiling though. Hi there. I tried planting in a barrel/bag last year. It was OK but not brilliant. They may have got a bit too dry, or the compost/medium wasn’t great. Maybe I should try again and see if I could do better! I haven’t ventured into potatoes in my garden yet, but have been considering using some of those grow-bags this year…I’m sure I’ll be pestering you with questions if we get them! I’ve only ever grown sweet potatoes before (too successfully) – they took over our entire front garden for the longest time. Mandy, how dare you successfully grow Sweet Potatoes! Only kidding, they are tricky to grow here, because of the short(er) summer, but it’s something I’d love to be successful at! Ah, the old peelings turning to sprouts turning to fully fledged potatoes! One problem is in making sure you hav emanaged to dig all your potatoes up, something I’ve never achieved, and consequently have “volunteers” dotted around my plot. I’ll be looking forward to seeing what you plant and how you get on this year. This is such a great post. My husband and I move a lot and I use that as an excuse not to grow things (we rent, but I guess I could do containers? ), but I can’t wait to settle down and grow stuff like this. Goodness! So many varieties! I dug some foodscraps directly into the ground last year instead of composting and was very happy to find fully grown spuddies months later. Potatoes seem to be remarkable in that they can grow from the tiniest scraps! It’s great to get a result, so smug is good for me too ! Thank you John, your encouragement, as ever is a treat in itself! this was excellent. and reminded me of why I love growing potatoes! I can hardly wait till spring so I can get the ground turned in the garden and get planting. My brother says my garden is bigger than some people’s house lot. I say he’s just jealous. hee hee. Hi Debra, and thanks for the compliments and encouragement 🙂 Space is always a problem, and we always seem to want more! Hi Tandy, I grew from seeds last year for the first time. A real experiment. They were very successful in terms of amount. And tasty too! Some people get to know potatos while checking out what is best for each dish… what is good for frying, and what for cooking. I’ve never grown any… Sorry about that. I think I would have enjoyed it, but it just didn’t happen. Like the picures. Thank you Shimon, the photos started as a way for me to document (and remember) what I’d grown, and whether or not it was any good, and from there I’ve moved on a bit as frankly some of the photos were pretty basic and in fact unappealing! 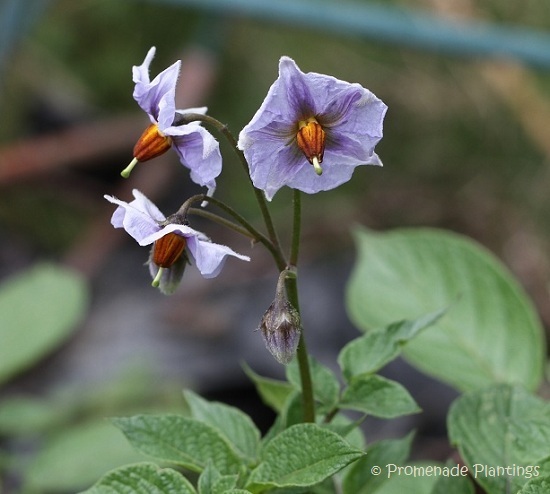 The flowers on potato plants are very small but I think pretty. What difference if the flowers are small. I think they’re beautiful. Hi, GREAT potato-post. Myself I grow a few, and I buy some varieties from a local farmer. Great stuff! Thank you Bente, if you can get local seeds that is even better, I rely on companies miles away from where I live. Loved this post, brought back memories of growing up on my parent’s organic farm. For potatoes, we tilled the ground, laid the seed potatoes on top, then added a foot of straw mulch harvested from our fields. The potatoes grew like crazy and we just lifted the mulch to pick them, no digging required. Misk Cooks’ barrel plantings sound similar, something I might try in my smaller garden. 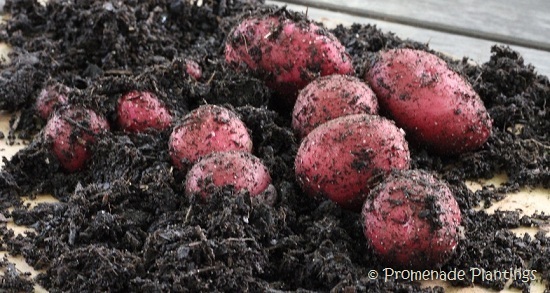 I like the idea of growing them with a straw mulch, I bet the potatoes come out really clean and easily, that’s a great tip! what an ultra injformative post! I’ve never grown potatoes, but want to try some this year. I’ve added this post to my “favorites” for use as a guide when I get started. Thank you, I think the post is a bit of a snapshot, as reams has been written about growing potatoes, and it’s basically my experience. So I hope you are successful!! I now have serious potato envy! Freshly dug potatoes are so satisfying, in contrast to the poor old spuds in the grocery store. Hidden treasures indeed! Never heard of the term chitting (? – did I get that right) – but half my potatoes start to sprout in the cupboard so tend to just plant them. We have an awful problem with Colorado Beetle in Bulgaria. My parents hated digging up potatoes when they were kids in my grandparents’ gardens, but I think it’s so much fun! I’m always excited to see how big they are. It’s like the adult version of finding buried treasure! As for the Colorado Potato Beetle, and I had a problem with those too, sprinkle barn lime on your potatoes. I haven’t tried it yet, but my family members swear by it. What is fun for one person is hell for another eh?! Interesting about the lime as limed soil can cause scab, but I guess it’s a different sort of lime? Could be? Not sure about that one. You taught me, took me along to the garden *and* made me have a great laugh or two. Perfect! Please pass the potatoes! Thank you Katherine, I just hope we get some rain this summer, as I never bother to water the potatoes, and the crop always benefits from at least some moisture! Great post – what I miss most in France ( with regard to potatoes) is the lack of good floury potatoes for the winter months. Good morning … terrific blog about potatoes… my most favourite of foods! I bought some organic seed potatoes here at Seedy Saturday (Victoria, BC) Last year was my first experience in many years in growing potatoes .. it felt magical to unearth them .. gifts from the soil! This year I’m going to grow them in containers. And good that you didn’t dig up the earth this year, leaving all those lovely mycorrhizal fungi to continue to nourish plant life. Tilling kills them & the beneficial microbes in the soil. Hi there and thanks for the thumbs up! I missed out on my local Seedy Sunday as I was in France, but to be honest I really don’t need more seeds, but it would have been nice to pick up some unusual potatoes. And I have to agree with you about the no digging, why disturb the workers! !